There’s no better resource for visitors who want to plan for a future vacation on Lake Lanier. It’s also perfect if you’re at the lake and you’d like to know what to do for a few hours or a weekend. We’ve got you covered! From lodging and campgrounds to marinas, activities, attractions and restaurants. You may download a copy for free at LakeLanier.com, thanks to the support of our initial sponsors. Thank you to Bev Knight and The Good Life Group, Lanier Islands, and “BIG FISH ON”. 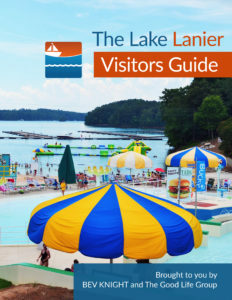 You may also purchase a paperback copy of The Lake Lanier Visitors Guide from Amazon. Would You Like Your Business Featured in The Guide? Please send us an email at info@lakelanier.com, so visitors can find your business too.